My wife and I visited our son Stewart who takes over the Nanaimo B.C. Kelsey's Restaurant, as General Manager in September. I got in touch with the Nanaimo Club, and specifically Bill Stewart the Club's Chief Examiner, over the internet. 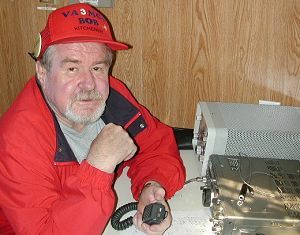 Bill has put a link to our www.kwarc.org, and to the Nanaimo web page. The city of Nanaimo proclaimed the week of Field Day Amateur Radio week, and sent the club a proclamation complete with gold seal. The city also bought the Emergency Measures group a bus complete with cooking facilities, washroom, 6 stations in the rear complete with 6VHF sets, and places for 4-6 HF sets up front. (see pics ve7jy web site which show interior setup). I had my HTX202 but difficulty with the battery, so used auto connector or wall charger. Bill offered me a Dualbander 2M. I declined as it operated OK. Weather is gorgeous. Stewart has rented a house on Departure Bay, right on the water. The sea is only 50 ft away and down 3ft. About 40 Canada geese patrol the waterfront in various configurations, continuously. Nearly ran into a deer in town. Was a mountain lion in town last week, decimated an Emu farm. The club has about 100 members although there are about 250 hams in the region. There are several clubs nearby.